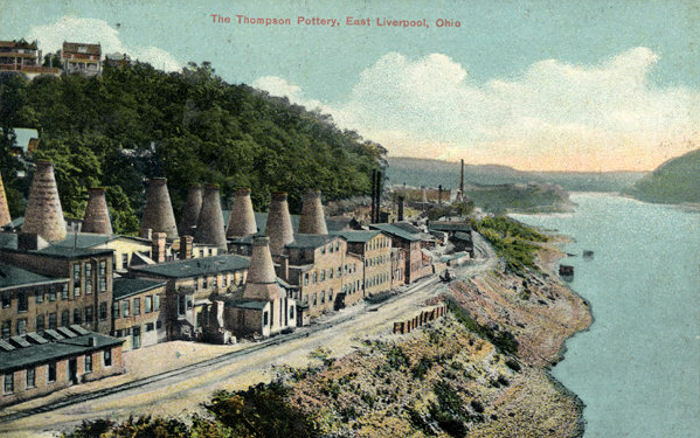 The most important industry of East Liverpool in the United States of America became the manufacture of pottery. Its beginning were found in the emigration of potters from the North Staffordshire potteries are of Stoke-on-Trent. James Bennett, a North Staffordshire potter, where he had been a packer in a yellow ware pottery, while traveling afoot from Cincinnati to Pittsburgh in 1839 stopped awhile en route in East Liverpool, and discovering the presence of clay well adapted to the production of yellow ware, conceived the idea of engaging in the manufacture of that article. With the assistance of Anthony Kearns, Benjamin Harker, George Hollingsworth and George Thomas, he built a small pottery, 20x40 feet, near the river at the foot of Second Street. 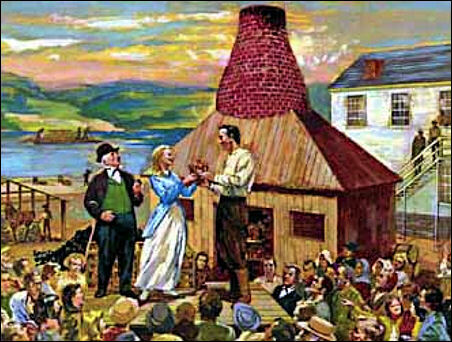 The first kiln was fired in 1840. Thomas Croxall & Brothers purchased the old Bennett Pottery and operated it until 1853, when it was purchased by I. W. Knowles. The ground upon which the old Bennett Pottery stood has long since been washed away by the river. In 1870 the Knowles. Taylor & Knowles Company were the first to begin the manufacture of white ware. 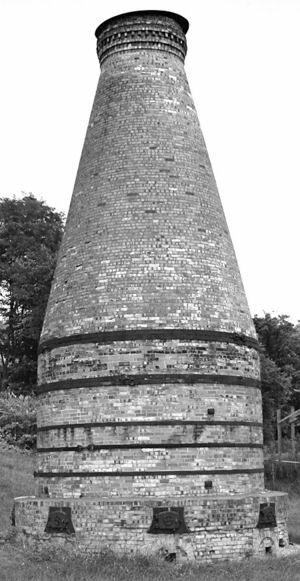 a representation of James Bennett's first kiln which was fired in 1840. "Largest Pottery in the World"
English immigrant James Bennett from North Staffordshire became East Liverpool's first successful pottery manufacturer in 1840, but it was not until the late 1800s that the town's reputation really emerged. East Liverpool's location along the Ohio River contributed to its growth over time, as did its local clay. Probably its most significant industry in the nineteenth century was pottery, originally made from nearby yellow clay. Many streets in East Liverpool to reflect the founders from the North Staffordshire pottery industry, such as Dresden Avenue, Etruria Street, Wedgwood Street and Ceramic Street. In the summer of 1842, the stage was set by a bitter miners' lock-out in the North Staffordshire Potteries; for six long weeks Lord Granville and other local coal-owners had closed the gates on their employees for resisting a reduction in wages. Many potbanks, dependent on coal for firing, were rendered idle. Unrest was growing in the Six Towns because of falling wages; miners were arrested for begging in Burslem's Market Place. Families were on the verge of starvation and the Potteries were a tinder box of discontent. In August of that year the Chartist riots took place leading to the Riot Act being read in burslem and mob destruction all throughout the six towns. Soon after these events New World fever swept through the Six Towns in the 1840s, when escape to North America was seen as the only way out for hundreds of locals at a time of high unemployment and industrial hell. Rather than give money to the strike fund potters were encouraged to donate to the the Potters' Joint Stock Emigration Society and Savings Fund which was set up in 1844 by William Evans, a prominent figure in the United Branches of the Potters' Society, but its impetus failed to match his initial enthusiasm. He believed emigration to be the panacea for all the ills of working potters. As there were more workers than work, his solution was to deport each unemployed member of the trade to America and a new life, assuring those left behind an enhanced market value. He envisaged an exodus of 5,000. When funds permitted, the Society bought a large tract of land in Wisconsin and divided it up into 20 acre holdings. Members entered a lottery for the prize of a little slice of the American cake; the draw was made in Hanley's Meat Market, amid great excitement, and eight families came up trumps. In time, more followed them to this promised land. However, like Potteries folk through the ages, many emigrants found the change from home too great and returned. Others could not settle to the farming life and took up hunting. Very few became wealthy. The town that grew up around that initial tract of Wisconsin holdings is called Pottersville. Whatever else they do there now, they have no involvement in the making of pottery. Evan's idea was too novel and far-reaching to command universal approval, particularly among people whose roots were deeply entrenched in North Staffordshire. As the Union became identified with the Emigration Society, its popularity wained and its membership declined, spelling the end of the Wisconsin venture. The Society collapsed in 1849 — and so did the Union. Volume i, no. i, was prefaced by a salutatory addressed 'To the Working Classes of the Staffordshire Potteries.' It contained sage counsel on the relative rights of labor and capital, an announcement of the policy of the paper, and subjects of articles planned for future issues. Following Mr. Evans' two-page introduction was a long contribution by Aaron Wedgewood, of Burslem, a sympathetic appeal for the down-trodden colliers of England. Mr. Wedgewood contributed other well written articles that appeared frequently in issues of the Potters' Examiner for several months, and while his name is associated with that of the great pottery employers of England, his appeals-were uniformly in the interest of labor. After a few issues when the magazine had become known to the workmen, Evans wrote an article suggesting that the potters consider the subject of emigrating to America...."
John Goodwin, who had worked at the pottery of James Edwards, Dalehall, Burslem, England, came to America 1842. Many of the emigrants, from the pottery districts, in those days, came by the way of New Orleans and up the Mississippi River to St. Louis. From the starting of his small factory Mr. Goodwin seems to have progressed far beyond the other potter plants of the same period and to have accumulated more money from his sales of ware than his competitors, which may have been that he had the advantage of having more practical experience than the majority of the others. John Goodwin operated this plant until 1853 when he sold it to two brothers, Samuel and William Baggott who were English Potters. For the decade following this transaction he devoted his time to the buying and. selling of real estate in East Liverpool, this being a period where the man with ready money could make many very advantageous and profitable deals. Goodwin decided, in 1863, to again enter the pottery business and with this end in view built The Novelty Pottery Works. William Woodward was a potter from the great Staffordshire districts, who came to America c.1847 - He left two sons, James and Henry Woodward and a grandson, William Woodward, who worked for many years in the decorating, shops of this district, becoming one of the most famous hand painters known in this section of the potting, districts, before lithographic work superceeded the older forms of copper plate printing. James and Sarah Vodrey were natives of Staffordshire, England coming to America in 1827, locating in Pittsburgh, Pa. Mr. Vodrey, being a skilled and experienced potter formed a partnership with a man named Frost, operating under the name of Vodrey and Frost, making Rockingham and Yellow Ware. 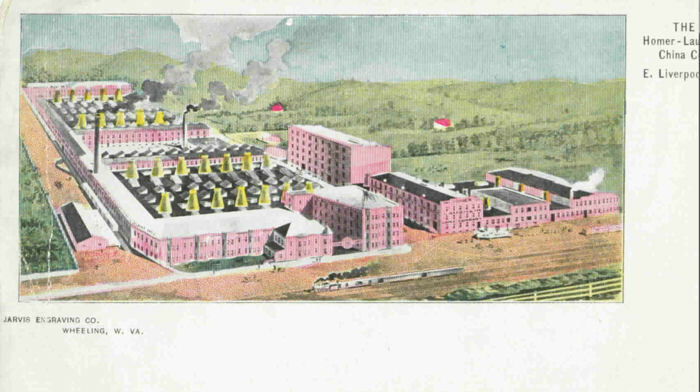 Vodrey moved to East Liverpool in 1847, evenualy founding the company that became the Vodrey Pottery Company. William Brunt left the oppression and starvation of the English pottery districts for America and freedom late in 1842. He came by the way of New Orleans and thence up the Mississippi River to the central part of southern Illinois. In East Liverpool he opened a public tavern, on the southwest corner of the public square, at Third and Market Streets, which he kept for a considerable period of time. Brunt, Senior, having been a potter, seeing the business developing around him strongly and in a profitable manner, naturally returned to this form of industry. In company with his two sons, William Junior and Henry,along with his brother-in-law Bloor, Mr. Brunt built a small pottery at the northeast corner of First Street and Peach Alloy. Here these men began the manufacture of brown, jet and "Scroddled" door knobs. The term scroddled is, in the old Staffordshire dialect, marbled or streaked in the body of the ware. In 1853, two brothers, Samuel and William Baggott, Englishmen, came from the Staffordshire Potting Districts and purchased the factory which John Goodwin had erected and was operating at the foot of Market Street in East Liverpool. Here the Baggotts started in to make Rockingham and Yellow Ware in a most successful manner which they continued for nearly fifty years. These two brothers were probably two of the oddest men who ever came from the English potting districts. They proved themselves thoroughly capable potters and business men but they seemed so utterly clannish that they never mixed with other people, evidently preferring to go their own way without the social contact which is always pronounced in small towns. In their manners and customs they made no effort to break away from the habits of their earlier days and preserved their very broad Staffordshire dialect to the end of their days. Their speech and mannerisms were widely copied in the making of rough jokes by both the Americans and their fellow potters. Samuel soon became "Aud Sam. Baggott," but William was reserved for greater distinction, he being invariably referred to as "Aud Biddum Waddle" Baggott. "Biddum," in the Staffordshire vernacular means William and the "Waddle" came several causes. both of the brothers were extremely wide of beam and literally waddled when they walked. Some time prior to 1850 Thomas Ball and William B. Morris, built a plant at the southeast corner of Second Street and Cherry Alley. (Now the site of The American Porcelain Company). Thomas Ball was a Staffordshire potter who came first to America by the way of New Orleans, in company with a brother named Timothy. 1858 - there were four of the Booth brothers, Israel, Abraham, Manuel and Adam. 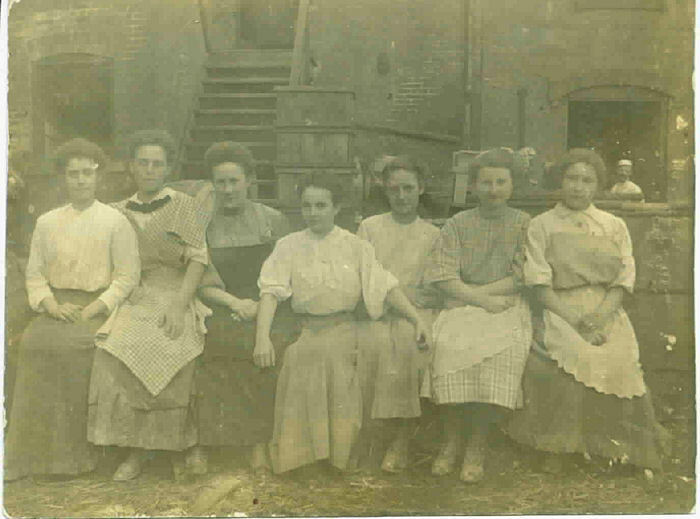 These people were, possibly, the most skilled group of potters who ever came into the new pottery center of East Liverpool, coming from the famous English branch of the Booth family who had been skilled in pottery work for more than two hundred years in to Staffordshire district. From the first, it would seem that the Booths "got in bad," not that there was anything wrong with them, but they were exceedingly independent and very pronounced in their views, holding very liberal ideas in church matters, which was almost a crime in those days. Be as it may these brothers were always "on the outside," which, however did not prevent the manufacturers of that day from taking every advantage they could possibly get from the skill of these men. George and Samuel Morley, Englishmen from the Staffordshire potteries came to the US in 1849, to Baltimore, working there a while for Edwin Bennett and later going to Alton, Ill., where they operated a small pottery until 1852, when they came to East Liverpool, working for several years for Harkers and Woodward Blakely & Co. 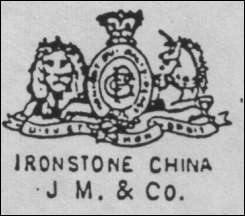 The firm of Starkey and Ourby was founded in 1869 - they converted the stoneware plant of Burgess, Webster & Viney into a pottery for the manufacture of Rockingham and Yellow Ware. At some time in the course of its life this pottery received the name of "The Star Pottery" under which name it was operated as long as it existed. Thomas Starkey was born at Stoke -on-Trent, England, April 21st, 1829. His parents were English, and his grandfather, whose name was Thomas also, was killed during a celebration, by the English people over the victory at the battle of Waterloo. "East Liverpool, a city of 13,000 residents, once was dubbed the "Pottery Capital of the World" and "America's Crockery Capital." Two hundred pottery companies operated there, 30 of which were quite large. One pottery company alone produced 24 tons of ware daily, and nearly three-fourths of the nation's whiteware was produced in the region in the mid-1800s. Because of the industry, the high school's sports teams took on the nickname the Potters. One major firm remains in East Liverpool - Hall China Co. - which has operated since 1903. 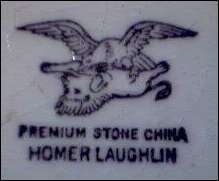 The Homer Laughlin China Co. also still exists across the Ohio River in Newell, West Virginia. It opened in East Liverpool in 1874, but moved to Newell in 1907. The Laughlin company still owns and operates a toll bridge it built in 1905 which links the two towns. 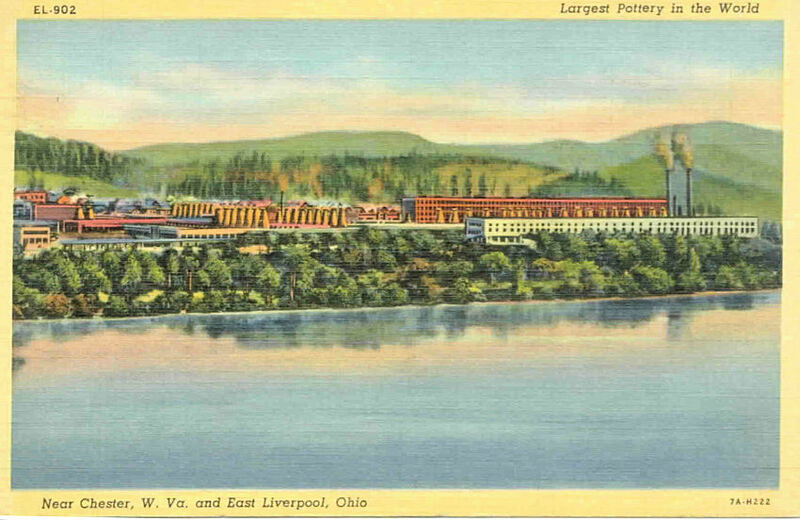 In the industry's peak period between 1840 and 1930, East Liverpool firms made more than half of America's ceramics. Some other famous firms were American Limoges, Fawcett, Standard, and Knowles, Taylor & Knowles. A prime river location, rich clay deposits and the skills of 18th century settlers combined to make it an ideal pottery-making region." today only four still exist in Ohio. Until the late 19th century, most dinnerware in the United States of America was imported from Stoke-on-Trent, England. However, in the 1870s and 1880s, several American potters began to make white "granite ware." 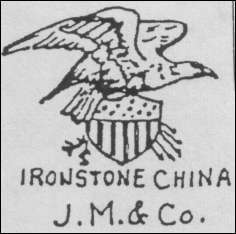 Most of the ironstone produced in the U.S. had simpler shapes than the English imports which were still preferred by Americans. As people became more confident in purchasing American made ware there was a transition from the British Royal Arms to the use of the American Eagle - below are examples of the Royal Arms and also the American Eagle from the same potter - John Moses. to use the American Eagle and shield.